Yeah you read that right, in Harley Quinn 12, Harley Quinn (along with Power Girl) defeat Thanos. And to think the Marvel Cinematic Universe are building up like 15 movies just until they can defeat Thanos, and Harley did it in one issue! Okay maybe she didn’t exactly defeat Thanos, but she did kill Manos! A parody of Marvel’s Thanos character. So if you have read any Harley Quinn issues before, then you know that her comic embraces the absurd. Which is fitting considering she is one of the craziest characters in the DC universe. If you don’t like that kind of craziness, then you’re not going to like this issue. But if you love that craziness, then you will love this issue! 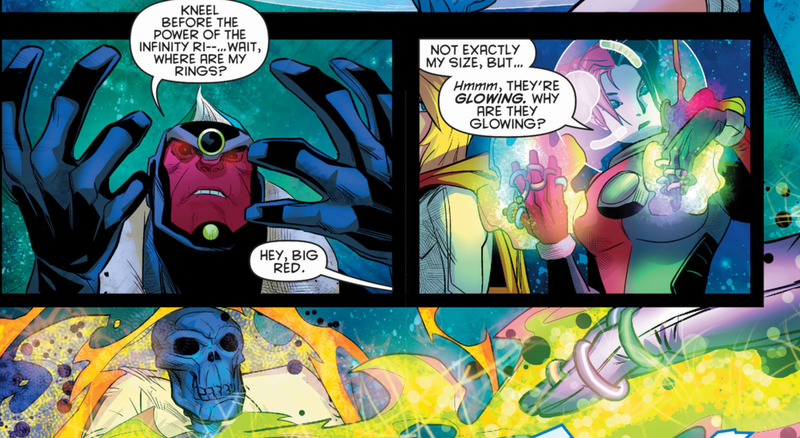 Harley Quinn 12 mainly takes place in a parody of the Marvel Cosmic Universe. Two of the lessor known DC villains transport Harley and Power Girl to another ‘galaxy’ where they must find a special ring to get them back to their Earth. And who’s going to help them out with their problem? Well a giant talking pug of course! The pug tells them that they need to go get the ring from…Manos! Who is Manos? Well he is the “ruler of the infinity rings” (*cough cough*). And where does he live? “Well he lives on a bunch of floating rocks in outer space with his kids…and they all hate him”. I love that the talking pug noted that, especially after the release of Guardians of the Galaxy, where you couldn’t help but laugh at the menacing Thanos who was just chilling the entire movie on a floating throne on a floating rock. Anyways what does Manos want? “He wants all the power in the universe and plans on destroying everything there is”. Harley of course asks the question we all want to know, “what’s he got planned the day after?”. Yeah these bad guys aren’t the best when it comes to planning really long term. They’re all ‘destroy everything’ but after they’ve done that, there isn’t much left to do. It’s just not very well thought out if you ask me. So of course Harley Quinn and Powergirl then go to the floating rock where they encounter a umm giant talking pizza? They eventually end up in a confrontation with Thanos Manos. Manos starts doing his evil monologue and starts telling the girls to kneel before the power of the infinity rings, but the next thing you know Harley ends up with all the infinity rings on her hand, which ends up blowing Manos up. Well that was easy. I love when these comics create a mock Marvel universe (something Grant Morrison also did in a recent Multiversity issue). Harley Quinn 12 was super fun, but didn’t add much to any larger story. But oh well, the Harley issues have always been a lot of fun, she’s basically DC’s answer to Deadpool right now. 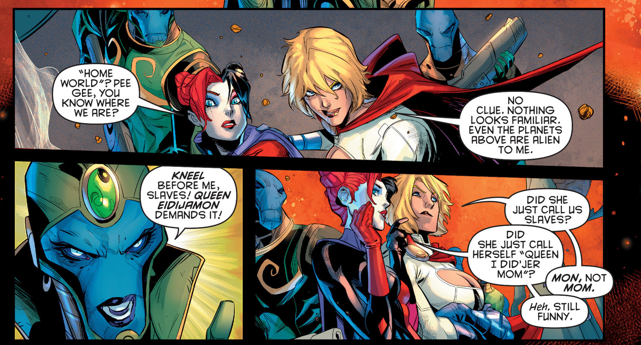 And of course the Power Girl/Harley Quinn team-up is awesome! 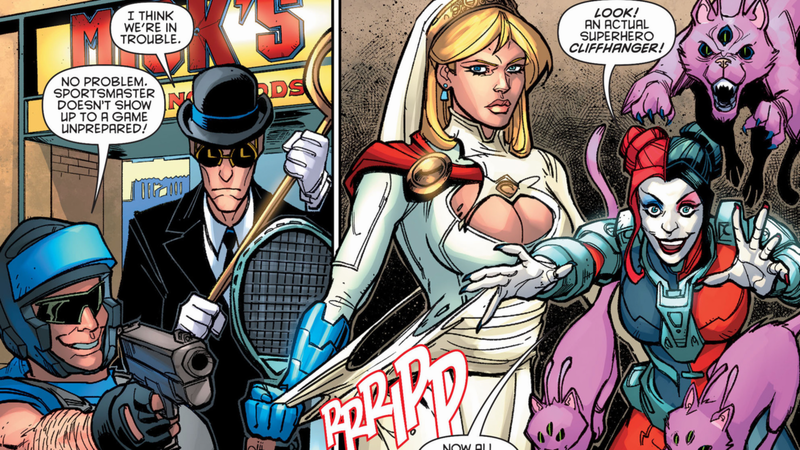 Harley suggests that the way to defeat Manos is with Power Girl’s ‘assets’. This issue was just a fun little story which reminded how much we love the craziness that is Harley Quinn. Her crazy stories are obviously working, because Harley Quinn’s comic is one of DC’s best selling comics every month. She sells more than every single solo comic of the Justice League members, except for Batman, showing her immense popularity. And it isn’t too surprising. Her comic is always funny and creative. And her character is so bizarre compared to other DC characters, so it’s good to have someone like her in the universe. Harley Quinn’s comics always like to poke fun at the ridiculousness that is the world of comic books. Whether it’s pointing out the revealing nature of Power Girl’s outfit, or the stupidity of some villains and their motivations, you can rely on Harley’s comic to give you a few laughs, which is exactly what it did in issue 12. And hey Avengers and Guardians of the Galaxy, if you need someone to help you out with your infinity war, I’m sure Harley would love to help you out! Universal’s Shared Monster Universe, The new Avengers?